From a timeless handed down pattern, this new revision makes optional a buttoned cuff, allowing this shoulderette to be joined in the front if desired. With smaller needles, and a leaving 24” tail, cast on 46 sts. Work in 1x1 ribbing as follows: For all rows: *K1, P1* repeating across until cuff measures 6” from cast on edge. Next row: increase by knitting into the front and back of each stitch across: 92 sts. 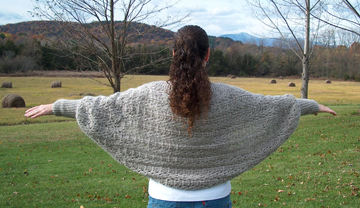 With larger needles, knit one row. For buttoned cuff: Work as above EXCEPT, at 1”, 3”, 5” from cast on edge, work a buttonhole (on the same edge) as follows: K1, P1, K1, YO, K2TOG, P1 and then finish the row in 1x1 ribbing. 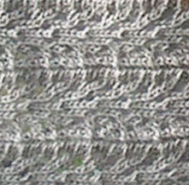 When lace pattern measures 41” (smaller) to 45” (larger) from increase row, end after a pattern row 6 is completed. Next row: with smaller needles, *K2TOG* across row: 46 stitches. Knit one row. 2nd sewn cuff: Work 1x1 ribbing as for first cuff, until cuff measures 6”. Bind off loosely in pattern. on the OPPOSITE edge of shoulderette, as shown in red dots in drawing. Bind off and cut yarn leaving 24”. Finishing: Soak/wash in warm soapy water, soak rinse in clear WARMER water, squeeze ut excess moisture and lay out to blocked dimensions, stretching cuff edges into a wider curve as it meets the lace pattern. Let dry overnight. With darning needle and yarn end, sew cuff edges together and continue, if desired to elbow (about 13”). Sew buttons on opposite side of cuff from buttonholes. To wear, button cuffs together OR lay cuffs flat, and wear shoulderette around back of neck and over the chest. SSK =decrease= slip, slip, knit = slip 1st st as if to k, slip the 2nd st as if to p, put point of left needle into fronts of those 2 sts, k both tog.